Ireland Golf Vacation Kildare (K-Club)-Palmer Course American in Character. 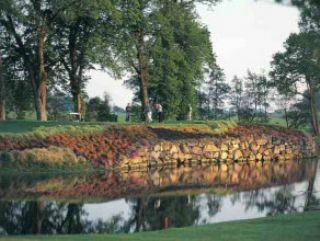 The Kildare, or K-Club's, North Course, an Arnold Palmer design, is generally seen as being more "American" in character than most Irish courses. Built on more than 200 acres of mature woodland, the layout contains several lakes and the River Liffey which can come into play. Four tee placements per hole make the K-Club challenging, yet fair and enjoyable for golfers of all levels. Recognized for its championship qualities, the K-Club has been chosen as the site for the 2006 Ryder Cup Matches.